Image caption Police called Saulius Vainauskas (pictured) and Viktorija Simkuniene's crime "brazen and heartless"
Two burglars have been sentenced for targeting the home of a man with motor neurone disease and stealing an iPad he uses to communicate, police said. Saulius Vainauskas, 32, and Viktorija Simkuniene, 29, admitted burglary after they were caught on CCTV entering the house in Peterborough in September. Vainauskas, of Cobden Street in the city, was jailed for 21 months. Simkuniene, of Russell Street, was given a 16-month sentence, suspended for two years. Police said the pair, who were appearing at Peterborough Crown Court, had claimed they were visiting a friend and had "got the wrong address". Officers said Mr Facer's house was equipped with CCTV cameras, which showed the pair "trying the window" before ringing the doorbell at the address on Park Road. Mr Facer, who uses a wheelchair, was able to open his front door remotely and he let them in because he was expecting a parcel, detectives said. He activated an emergency button after discovering his iPad was gone when they left. 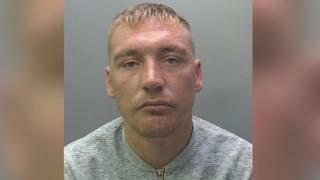 Det Con Fran Scott, of Cambridgeshire Police, said: "This was a brazen and heartless crime. "To take away a lifeline and only method of communication from a disabled man who was powerless to do anything is despicable. "I hope it serves as a lesson to anyone who thinks they can target vulnerable people."